Small Branded Champagne Bottles such as these can make a huge difference when it comes to advertising your Company brand-name and logo during a business convention or trade show. Full colour digital printing ensures total personalisation, utilising your artwork, corporate crest and branding for a custom business gift for any customer. 20cl of Bernard Remy says your brand-name will be on the tip of the customers tongue, and you'll gain a classy reputation along the way. 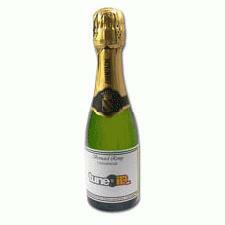 Small Branded Champagne Bottles are also brilliant gifts to your guests at wedding and christenings..
For a FREE QUOTE, please fill in the form regarding our Small Branded Champagne Bottles and we'll be able to help you.